"This study demonstrates that human activity has a visible and significant impact on cloud cover and, therefore, on climate. It indicates that contrails should be included in climate change scenarios," Minnis said. Minnis determined the observed one percent - per decade increase in cirrus cloud cover over the United States is likely due to air traffic-induced contrails. 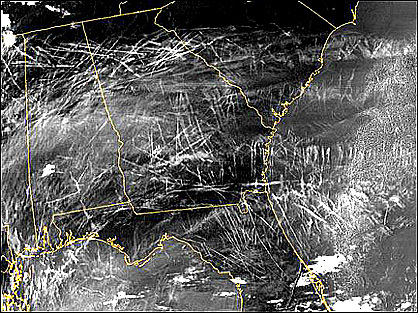 Using published results from NASA's Goddard Institute for Space Studies (New York) general circulation model, Minnis and his colleagues estimated contrails and their resulting cirrus clouds would increase surface and lower atmospheric temperatures by 0.36 to 0.54 degrees Fahrenheit per decade. Weather service data reveal surface and lower atmospheric temperatures across North America rose by almost 0.5 degree Fahrenheit per decade between 1975 and 1994. Minnis worked with colleagues Kirk Ayers, Rabi Palinkonda, and Dung Phan from Analytical Services and Materials, Inc., of Hampton, Va. They used 25 years of global surface observations of cirrus clouds, temperature, and humidity records from the National Centers for Environmental Prediction (NCEP) re-analysis dataset. They confirmed the cirrus trends with 13 years of satellite data from NASA's International Satellite Cloud Climatology Project. "Humidity" is the amount of water vapor in the air and it determines how long contrails remain in the atmosphere. Contrails that persist for an extended period of time are most likely to impact the climate. NASA's Earth Science Enterprise funded the research. NASA's Earth Science Enterprise is dedicated to understanding the Earth as an integrated system and applying Earth System Science to improve prediction of climate, weather, and natural hazards using the unique vantage point of space. However, since the study, NASA has slowly removed "The Earth" from the focus of its mandate which is causing some to suggest that some governments and corporations are seeking to adjust findings about climate change, leading both scientists and conspiracy theorists into asking the question "Why?". As early as the spring of 2004, NASA scientists were discovering study results which found that cirrus clouds formed by contrails from aircraft engine exhaust, are capable of increasing average surface temperatures enough to account for the warming trend in the United States that occurred between 1975 and 1994. "This result shows the increased cirrus coverage, attributable to air traffic, could account for nearly all of the warming observed over the United States for nearly 20 years starting in 1975, but it is important to acknowledge contrails would add to and not replace any greenhouse gas effect," said Patrick Minnis, senior research scientist at NASA's Langley Research Center in Hampton, Va. The study was published April 15, 2004 in the Journal of Climate. "During the same period, warming occurred in many other areas where cirrus coverage decreased or remained steady," he added. Two photos showing the magnitudes of contrails over the highly populated area of California as flights move to the Los Angeles area from flight paths from the Pacific Northwest and the northeast. 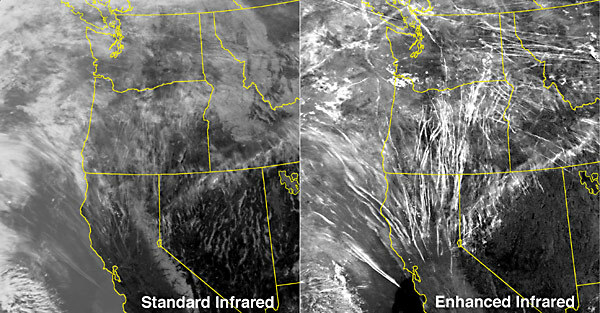 The photo on the left shows conventional satilite imagry that appears to show cloud cover, however using enhanced infrared photography, the photo on the right shows contrails as the source of the cloud cover. For quite some time NASA has been seeking to educate skywatchers about contrails, going as far as to recruiting young students to watch and record where there is significant activity in the sky. Clouds are the largest "variable" controlling Earth's atmospheric temperature and climate. Any change in global cloud cover may contribute to long-term changes in the Earth's climate. Likewise, any change in the Earth's climate may have effects on natural ecosystems. Contrails, especially persistent contrails, represent a human-caused increase in high thin clouds in the Earth's atmosphere, and are likely to be affecting climate and ultimately our natural ecosystems. Contrails are clouds formed when water vapor condenses and freezes around small particles (aerosols) that exist in aircraft exhaust. 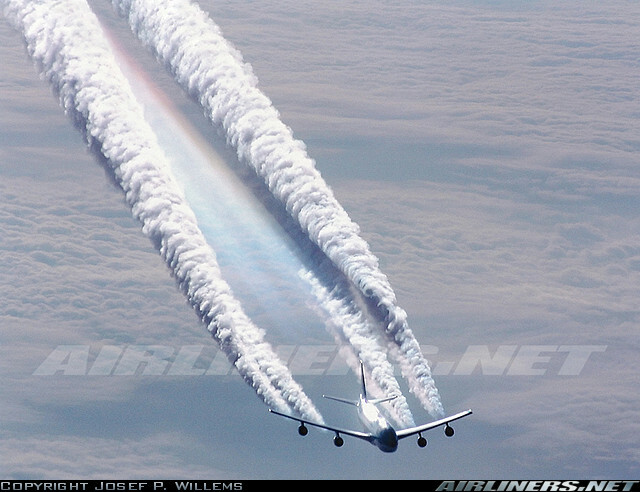 Some of that water vapor comes from the air around the plane; and some is added by the exhaust of the aircraft. The exhaust from an aircraft contains both gas (vapor) and solid particles. Both of these are important in the formation of contrails. Some elements of the exhaust gasses are not involved in contrail formation but do constitute air pollution. Emissions include carbon dioxide, water vapor, nitrogen oxides (NOx), carbon monoxide, hydrocarbons such as methane, sulfates (SOx), and soot as well as metal particles. Are there different types of contrails? Contrails are all made of the same materials and are formed in the same way, but exist for different lengths of time. Because of the differences in contrail "life-spans", contrails can be divided into three groups: short-lived, persistent (non-spreading), and persistent spreading. Can contrails move, or do they stay in the location where they were formed? How are contrails different from other clouds? Contrails are "human-induced" clouds since they are formed by water vapor condensing and freezing on particles from airplane exhaust. Contrails are always made of ice particles, due to the very cold temperatures at high altitude. Other types of clouds can be formed by water vapor that condenses on particles which are present in the atmosphere due to many sources, such as from volcanoes or dust storms, not specifically from aircraft exhaust. Those clouds are sometimes made of water droplets, and sometimes ice crystals, depending on the temperature where they form. Contrails only form at very high altitudes (usually above 8 km) where the air is extremely cold (less than -40 degrees C). Other clouds can form at a range of altitudes, from very close to the ground, such as fog, to very high off the ground, such as cirrus clouds. When were contrails first observed? Contrails were first noticed during high-altitude flights in the 1920's. However, interest in contrails really blossomed during WWII when bombers could be sighted from miles away. In fact, numerous WWII veteran accounts tell of problems in aviation due to massive contrail formations. Planes could not find their targets, and sometimes collided with each other. In 1953, a scientist named H. Appleman published a chart that was used to determine when a jet airplane would or would not produce a contrail. Scientists are most interested in persistent contrails because they form long-lasting and sometimes extensive clouds that would not normally have formed in the atmosphere. Persistent contrails can last for hours or for days, and spread over thousands of square kilometers, becoming indistinguishable from naturally occurring cirrus clouds. Scientists are concerned about contrails because predicted increases in air-traffic could result in a continued increase in cloud cover. Knowing when and where contrails form is key to determining their contribution to cirrus cloud cover and their effect on the energy balance. Thus, collecting information on short-lived contrails is also of interest. travel fear and the unknown. As the Kelowna International Airport expands and as a new Rockies International Airport moves into full operation in Cranbrook there’s no doubt that more air traffic is in our future. Communities are eager for the opportunities that international status brings as more regular destination flights arrive and depart from places like Toronto and New York. This bumps tourism up a notch allowing the BC Interior to push destination marketing beyond Vancouver and Calgary. But there’s more to consider as we move into the big leagues of air traffic, and there’s much that we don’t know about the crowded skies overhead. In fact we can join with the rest of the continent as concerns begin to grow about impacts as a result of more air traffic and more harmful emissions. In most cases the public might not hear of the close calls that occur in the sky, but that wasn't the case on January 10, 2008 when it was reported that turbulence from the wake of a passing aircraft could have been what caused an Air Canada jet to suddenly descend, injuring 10 people. The Transportation Safety Board of Canada told us a number of things, including wake turbulence may have caused the incident over northern Washington State as the Victoria - Toronto flight straddled US/Canadian airspace over the BC Interior. Transport Canada publications warn pilots to "avoid the area below other aircraft" and note that "aircraft flying into the core of a wing tip vortex can experience a rapid vortex-induced roll. Small aircraft encountering large vortices may not be able to recover." There were 88 people aboard the Airbus 319 that suddenly plunged thousands of metres, rolling sharply from left to right. The 10 injured passengers and crew were treated in a Calgary hospital. There were some interesting questions that surfaced as the events from Flight 190 began to unfold. First, was an early report that an aircraft above Flight 190 may have been an American B2 Stealth Bomber flying out of the American military base in Spokane. Second, was the question, why did Flight 190 with 10 injured passengers fly much farther to Calgary for emergency services instead of closer airports in Cranbrook or Kelowna? The report that a B2 Bomber may have been involved was quickly countered with an alternative domestic flight, and then countered again with unknown factors of turbulence associated with the Rocky Mountains or one of the other mountain ranges beneath the flight. Avoiding an emergency landing in Cranbrook or Kelowna may have been all about the lack of emergency capacity for a large number of passengers, but in fact we don’t know. The knee-jerk concern is that more air traffic will lead to more air accidents, but a closer look might suggest that pollution and rogue use of our skies are bigger concerns. Currently, there is shocking evidence that air travel is changing the planet and that it should become a priority for all levels of government including municipalities. Residents should become more educated about the impacts of more air travel in places like the Okanagan. There’s not a lot of data that examines such impacts in the Okanagan Valley, however in more urban areas especially in the United States, we can learn much about what’s happening in our skies. The Okanagan's neo-indigenous and independent news network.